Just licked the crumbs off my fingers from the bagel and cream cheese I devoured after church, and am sitting by the picture window with a big mug of Lavazza coffee contemplating the week past and the month ahead. It was so fun to play Simon’s letter game and have so many of you join in. The best part for me was learning about so many music artists and films which are totally new to me. I mean, new like I dropped in from another planet. Clearly, my knowledge of literature far outweighs my knowledge in the other arts. 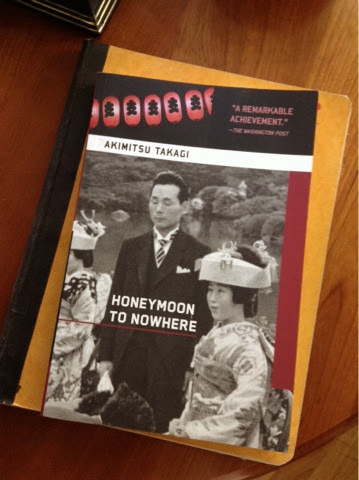 Of course I will be reading and reviewing each during the Japanese Literature Challenge 8, from now through January, 2015. And, don’t forget to enter the give-away for The Summer of Darkness which ends July 15. Another obvious thing which happened this week is the new blog template. Well, it’s not new that I fiddle around with the look at Dolce Bellezza. What’s new is actually purchasing a new template which you now see installed. While I love almost everything about it, a few of you dear readers have mentioned one tiny flaw: the font is too thin, and too light, to easily read. Now, if someone can’t read your blog posts it seems rather pointless to write a blog. So while I waver between keeping this one, and returning to Blogger’s boring ones, keep your opinions coming. I certainly don’t want anyone to struggle through my blog. And now for thoughts of July. I’ve already read a fabulous book for Spanish Lit Month, the title and review of which will be revealed when July does in fact arrive. Suffice it so say for now that this particular work has a connection with the Dublin IMPAC award, if you know what I mean, and well deserved it was, too. As one of the four hostesses for Paris in July, I am planning many reads and reviews of things parisienne. See the yellow cahier under the Japanese books above? It is a journal from August, 1972, which I wrote during one of the trips to Paris my family took. The musings of the 11 year old I was are hilarious, and I will share them with you at some point in July along with the writings of professionals. First up, on July 5, will be a review of Paris Was Ours by Penelope Rowlands. It is a collection of essays from 32 writers who actually leapt into the dream of living a Paris life for themselves. Such inspiring stuff. I hope that you’re planning on tasting some of what July has to offer in the book blogging world. As for me, I’m so thankful that I have summers off for reading. Your new books look perfect for you! I'm such a fan of the genre! I'm so sorry, I don't know why! Your font looks great on my computer, as does the rest of the template, so I hope you can get it straightened out for others. 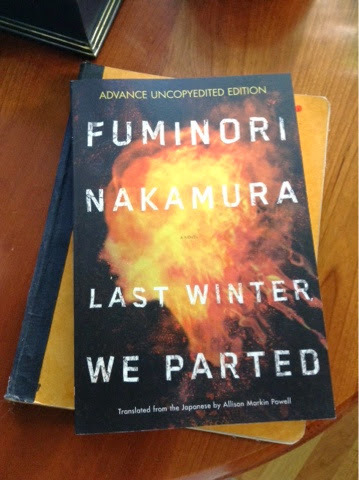 I'm looking forward to being a part of the Japanese Literature challenge! I need to finish up A Tale for the Time Being and I want to try to read The Makioka Sisters. Well, at least you got something to appear here; who knows why these problems occur…I've been going over titles for Paris in July, too, waffling on what to read. I just picked up On The Rue Tatin by Susan Herrmann Loomis, which looks great, but my heart is also crying out for a classic. A big, beefy, sink-my-teeth-into classic such as Flaubert's Sentimental Education. Japanese literature in French? You amaze me! Andi, thank you for that encouragement (about the font); I wish I could see the my blog on everyone's device so I knew how it appeared to them. Even on my iPad, I have to magnify the screen a bit on many things I read. I've wanted to read The Makioka Sisters since I saw the reviews from past participants a few years ago…looking forward to your thoughts on that and on Ruth Ozaki's book. 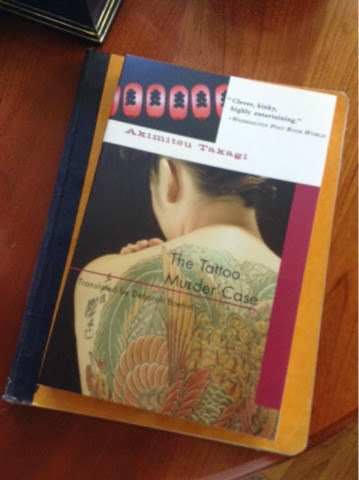 The Tattoo Murder Case sounds like another mystery novel I remember by another Japanese writer. It looks splendid. Wonderful mailbox. I love the new look and the font is fine on my end – no problems reading your posts. 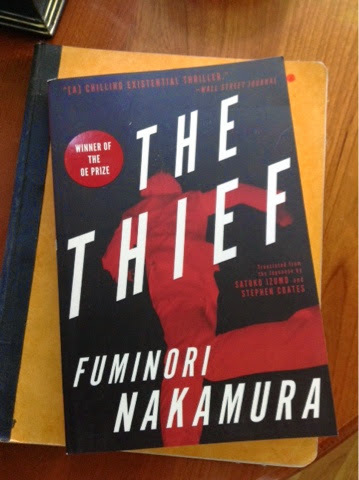 Those books look so good, especially The Thief. Can't wait to read your thoughts on them throughout the JLC8 🙂 I'm excited about Paris in July – I'm looking forward to reading everyone's posts. And, I love the idea of you sharing from your journal with us. Hope you have a great week! Your new design looks great on my MacBook! I'm so tired of blogger the blogger templates and really want to try a new look. One of these days.. Still don't know what I'll read for Paris in July, but am close to settling on The Sweet Life in Paris by David Lebovitz. Your new books look wonderful – enjoy! Oh I love this new look! Can you not edit the template to change the font size? I'm guessing no, since you had to purchase it, but if you could, that would be so awesome! I haven't read anything like it, so we'll have to see if it's what you're thinking of when I post my review. You do read a lot of wonderful mysteries! Ooh, JoAnn, I would love a MacBook! I'm stumbling around on my iPad mini where every single thing looks smaller than it ought. Trying a new template is trickier than it looks. There's always something a teensy bit off: the comment threading, or the font, or the links…something gets in the way. WordPress has a ton if beautiful themes, but I don't know how to transfer my own domain. Anyway, looking forward to your letter post. And your Paris read. I love your new look. The fonts look quite readable to me. I especially love the header. Trust you to have read those mysteries already! And, I'm glad you endorse Akimitsu Takagi, a totally new writer to me. Believe me, my 11 year old thoughts are not all that enlightening. Funny, yes. Insightful, hardly. Thanks, Nishita. I'm glad to know its legible for you. I like the header too, as well as the general whiteness and simplicity. I agree, centered text in several paragraphs can be tricky to read. I'll try putting it in block. Thanks for sharing your thoughts.